I’ve run a Joomla site, and a Campaign Monitor subscriber list for around 18 months. 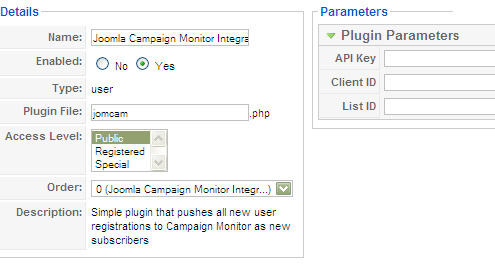 For most of that time I’ve manually exported subscribers from Joomla and imported them to Campaign Monitor. Finally I got fed up, and put together a simple Joomla to Campaign Monitor plugin. The plugin auto-subscribes new users (Whether they register deliberately, or are created by other plugins – e.g. by purchasing from a Virtuemart store) to your chosen Campaign Monitor list. Obviously, you’ll want to make sure that you have the user’s permission to contact them as part of the registration policy. Does this synchronize your CM subscriber list with the Joomla user list? If someone unsubscribes from the CM list, are they removed from the Joomla list? No – this is a simple one-way integration. After all if someone unsubscribes from your mailing list that doesn’t necessarily mean they no longer want to be a user of your site…. How easy would it be to add a conditional statement to check if the user has checked a ‘subscribe to …’ option in the registration form, where the registration form is managed by community builder? You mean so that the plugin could check that attribute, and only subscribe them if it was ticked? I’m not sure how community builder works (Never used it myself), but I guess it’s all feasible. Great plugin, I would also be interested in adding an additional ‘subscribe to…’ opt-in checkbox in the user registration form as dylan has suggested, has anyone had any luck integrating this feature with the standard joomla registration form? If you’re using Virtuemart and registering users via the checkout then this is pretty simple actually. Just go into “Manage User Fields” in the Virtuemart admin area and create a checkbox field with the description etc. as you want it. Then in the plugin, you can check whether the box is ticked by checking $_POST[‘vm_emailoptin’] (Or whatever ID you gave your field). If you’re not using Virtuemart, and just the standard com_user registration, then I imagine you could achieve the same results by setting up a template override for the registration form and adding your field in there annd checking the same way. Hi, this plugin sounds good, I think it’s what I’m looking for. But I would like to include the opt-in checkbox as mentioned by John. I don’t know much PHP, could you give me an idea of what line to include the above check. Does this work with community builder? I’ve never used CB so can’t comment definitively. If user’s are created as Joomla! users though, then it should work just fine. Tested and verified — it works. Very cool! hi I have a non-member shop in virtuemart. how can I get this to work without registering users? Virtuemart triggers an event called onVMCompletedOrder, you could try modifying the plugin to attach itself to that rather than onAfterStoreUser. The only thing that’s not too clear is whether the information you need is available in that event. Hi, this looks just as the plugin i am looking for. I have trouble installing it. Joomla sayes could not create folder. Any ideas ? That sounds like a permissions problem with Joomla! rather than anything specific to this plugin. Check that plugins/user/ is writeable by your webserver. Thank you for your quick answer. Where do i check that ? I can do pretty much everything in updating products and so. I see now thet the RS Firewall is causing the trouble. i must find a way to get around it. I can’t seem to get this to work, it has installed correctly and all the details are entered correctly, the plugin is enabled. When I register a new user on the site nothing happens in campaign monitor, I am using virtue mart also. does the user need to make a ourchase before they are registered? It’s possible that the code posted here is incompatible with recent versions of Joomla! / Virtuemart / CM APIs. I’m afraid I can’t really offer any advice as I don’t use Joomla! myself any more. Seems that you’ve created a great extension! Just one question: will it work with Joomla 2.5? I haven’t used Joomla! since 1.5 so no idea if this would work on anything other than the version it was originally coded for, but I suspect not.